4" round flush canopy mounts to a standard 4" square junction box with round plaster ring (provided by electrician). Electronic transformer fits inside junction box. 3" to 24" versions for wall or ceiling mount, 36" to 72" versions for ceiling only. 3" length: 12 volt, MR16 up to 50 watts. Other lengths: 12 volt, MR16 up to 75 watts. Lamp not included. 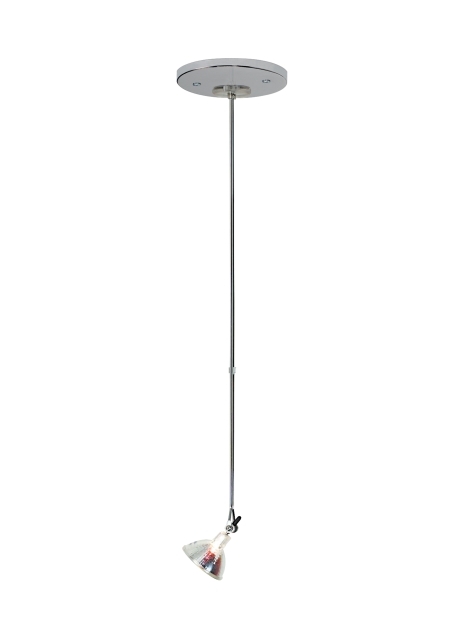 Fixture ships with chrome arms and is available in black or chrome canopy finish. Length -- Choose -- 3" 6" 12" 36" 48" 60" 72"